A kinetic sculpture by artist Reuben Margolin consisting of 400 acrylic rods which move up-and-down and side-to-side. The sculpture mimics the murmuration of starlings, one of nature's most extraordinary sights with the movement of a few hundred birds conveying a sense of suspended reality. But, according to Margolin, things of such beauty don't actually make for good sources of inspiration as "inspiration isn't something like a net that can be cast over a beautiful object, then drawn in." Instead the sculpture finds its origins from a conversation with his five-year-old daughter when he asked her what waves do. 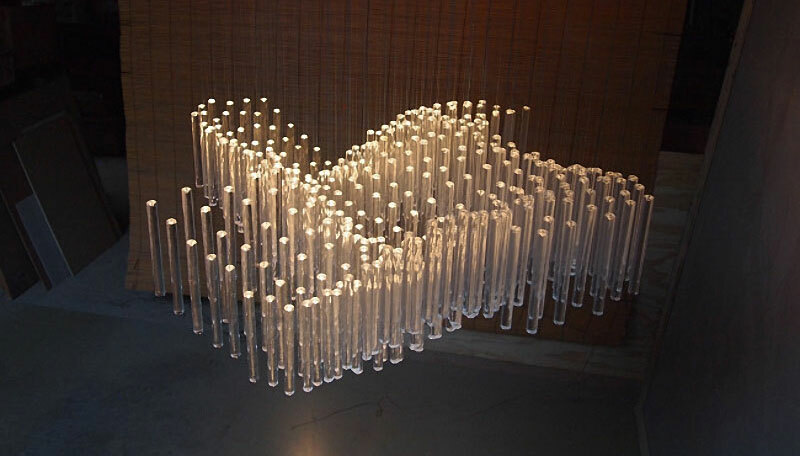 A kinetic sculpture by artist Reuben Margolin consisting of 400 acrylic rods which move up-and-down and side-to-side.